"Robotic systems, designed and manufactured by OR Productivity PLC’s FreeHand, hold and manipulate laparoscopes and cameras during keyhole (laparoscopic) surgical procedures, providing a rock-steady image and eliminating the need for medical assistants to hold them. The company’s new robotic arms have been roughly halved in size while retaining a solid image, making FreeHand’s solutions smaller, more precise and more flexible than any other existing robotic medical assistant. FreeHand presented its new system to the public at Annual American College of Surgeons meeting in San Diego. 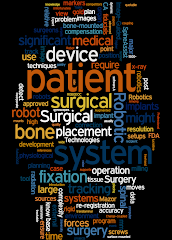 The devices were very favorably received attracting attention from surgeons around the world. Interest in combining FreeHand with the new generation of robotic operating tools that are emerging was widespread among both suppliers and surgeons. The addition of this new robotic arm to its line of products will increase the range of surgical procedures that can easily utilize FreeHand meaning a robot assistant can be provided for the full range of abdominal procedures. The firm’s clinically-proven system has already been used in over 10,000 Urological, Gynaecological and General Surgical procedures all over the world and is contributing to improved surgical outcomes, patient recovery rates, operating room efficiencies and is lowering overall procedural costs. FreeHand says the system can be integrated with existing operating theater equipment and practices. It estimates that more than eight million surgical procedures worldwide - and every hospital in the world that performs laparoscopic procedures - could benefit from its products. Recent research showed that NHS hospitals in England could undertake 17 percent (280,000) more non-emergency operating procedures every year with better-organized operating theater schedules. The research, which analyzed 2016 data collected from operating theaters in 100 NHS Trusts in England revealed that more than two hours a day are wasted on average. This suggests that operating theaters are significantly underutilized, with each procedure being more costly as a result. The FreeHand system enables surgeons to operate with fewer assistants, thereby contributing to removing one of the key drivers to delays – restriction on staff availability. Combined with the ability to reduce average procedure time, NHS hospitals adopting such a system would allow them to carry out more operations without the need for extra resources, and potentially save hundreds of thousands of pounds in lost procedure time. Surgeons performing invasive surgery with the company’s robotic arm are able to see a still, steady image of the area they are operating on. In the past, holding a keyhole camera for several hours tended to produce an unstable image. Shaky, ultra-realistic images generated from 3D and 4K cameras can cause motion sickness and nausea when viewed for long periods of time. But FreeHand means that humans are no longer needed to hold the camera, freeing up staff for more skilled work and stopping the need for staff to be pulled from other areas just to hold a camera. “Traditional surgical telescopes and cameras used in keyhole surgery are held and manipulated by the operating surgeon. In addition, they need trained medical staff with a steady hand to hold the camera, all for up to four hours at a time or longer.” Explains Charles Breese, Chairman of OR Productivity."